Last year, on Sept. 29, my wife’s grandfather William Burke, the center of her family, passed away. Rocky, as he was known to family and friends, was a larger-than-life gentleman who would enter a room and, on the rare occasions when he didn’t know everyone, would make a point of befriending every last person during the course of their encounter. Rocky was a supernode in the world of social networks before we thought of them as such — and he went out of his way to make sure people’s lives were better for knowing him. Rocky also enjoyed a good libation, several in fact. Growing up in the Irish Channel in New Orleans, Rocky came from a culture surrounded by alcohol. And, while he demonstrated an understanding of the responsibility drinking entailed, he never let that get in the way of heartily embracing the bonhomie it produced. Rocky wasn’t a stranger to anyone and he wasn’t a stranger to beer. This is why I recently decided to turn my wine- and cider-making apparatus and technique towards the goal of creating a brew in honor of Rocky. In hindsight it almost seems preordained. 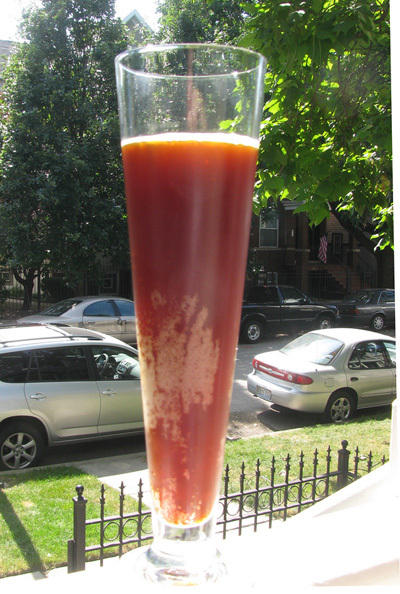 Had to make an Irish Red Ale, of course. But it was anything but orderly. Making beer, while on paper simpler than making wine, is different in important ways — most notably, the use of more separate ingredients and high heat. I’d had the components for months but they went unused until my old Atlanta pal Patrick Childress found himself in Chicago on a work assignment. Patrick is a beer-schooled brewmaster and his tutelage was absolutely essential to the undertaking. My family and I spent a fantastic summer Saturday with Patrick as he stepped us through the finer points of beer-making with the deep knowledge and quick wit of a Food Network host. Here’s a video of the day’s activities, wonderfully narrated by the brewmaster. It turned out great, far better than expected and, I’ll admit, better than the wines we’ve made in the past. Helps to have a board-certified brewer in the mix. 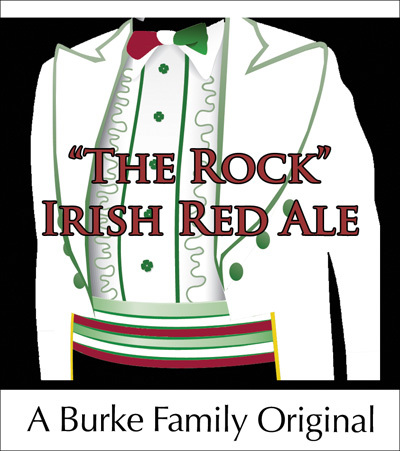 If you’ve never had an Irish Red Ale I’d recommend O’Hara’s Irish Red or Great Lakes Conway’s Irish Red. (You get a sense of what it should be from Killian’s, but as the Sam’s Liquors beer ubergeek told me, that really isn’t what it should taste like.) Or, get yourself over to my place and we’ll crack The Rock. The label was particularly fun to make, if not an example of exceptional illustration skills. 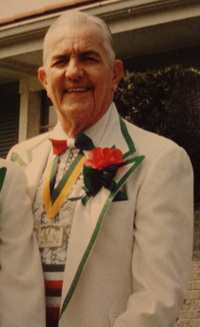 Every year for the New Orleans St. Joseph’s Day parade Rocky would don an red and green tuxedo and march with Italians (and Irish), celebrating his neighborhood and their traditions. We have many photos of him in a variety of Leprechaunish garb — all of which capture in a small way the man’s love for fun and embrace of the moment. So here’s to you, Rocky. A tip of the hat, a clink of the glasses. Sláinte! Thanks for many wonderful years.